“My husband said the house screamed for antique furniture–but I have a hard time with sameness.” This candid recollection by a lively collector provides a partial explanation of how and why she and her late husband joined their appetite for antique furniture and folk art with abstract expressionist art and contemporary sculpture. The rest of the explanation lies in the couple’s openness to visual experience and their sense of adventure. The result is a dynamic collection thirty-five years in the making that illustrates the harmony between artistic expressions of different centuries and cultures. Fig. 1. A leaping hare by Welsh sculptor Barry Flanagan (1941-2009), 1992, stands opposite the front door of the collectors’ Pennsylvania house. Fig. 2. The lyre-shaped rosewood grain-painted door chime dates from 1820-1830. To the right a painted chest with praying angels decoration made in the Mahatongo Valley of Schuylkill County, Pennsylvania, in the late 1830s provides an unexpected counterpoint to “Broadway”, a 1915 oil by Albert Gleizes (1881-1940). Fig. 3. “La Monde Elegant” by Jean Dubuffet (1901-1985), 1950, and “Woman in a Rowboat”, a large charcoal and oil by Willem de Kooning (1904-1997), 1975, together with neoclassical furniture–Philadelphia armchairs, a New York breakfast table, a Salem sofa, and a Boston worktable–command one corner of the living room. Nineteenth-century glass adds reflective color. Fig. 4. “Loplop presente une cage”, an homage to his friend Pablo Picasso (1881-1973), by Max Ernst (1891-1976) hangs above a red-painted Baltimore settee of c. 1810. An upturned weathervane needle catches the visitor’s eye. Fig. 7. The forms in “Baigneuse” by Jacques Lipchitz (1891-1973), 1960, resonate with an untitled work on paper by Joan Miro (1893-1983), 1974, and with the turret corners and scrolled stretcher of the green-painted marble-topped pier table of c. 1815, made during the golden age of Baltimore furniture. Fig. 9. The deep grey walls in the dining room set off the bold colors of “L’Ecuyere et son cheval” by Fernand Leger (1881-1955), 1954 (above the mantel), and of Dubuffet’s “L’homme au papillon” of 1949, above the inlaid Baltimore sideboard of the late 1790s. The 1820s New York dining table is surrounded by a set of chairs from Salem, 1800-1805, with carving attributed to Samuel McIntire (1757-1811). Fig. 10. Spatterware of all shapes and sizes lines the perimeter of the kitchen. Arp’s “Paolo et Francesca” (1926) shows the relationship between the expressive abstract forms painted by Arp and his contemporary Miro. 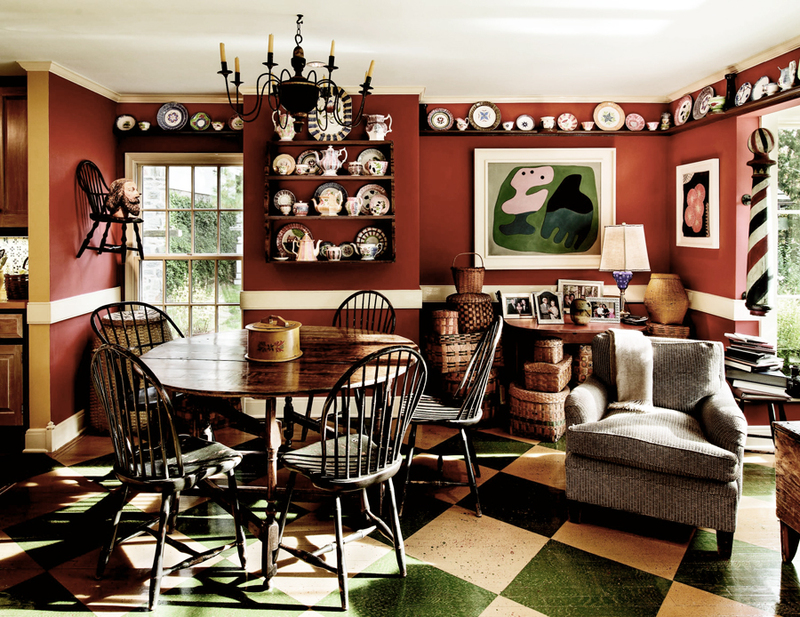 Windsor chairs, a gate-leg dining table, and a remarkable collection of hand-painted American indian baskets are among the other collections found in the dining and seating area. Fig. 11. This watercolor by Alexander Calder (1898-1976) depicts his vision of the perfect room; the collectors have nearly fulfilled his mandate, with works by Leger, Arp, and Miro, complemented by Windsor chairs and a trestle table. Fig. 12. A maple high chest from New Jersey, c. 1735, stands on the upstairs landing with nineteenth-century bandboxes at its feet. The blend of old and new begins in the courtyard of the 1935 painted stucco and Wissahickon schist house by Philadelphia-area architect Walter K. Durham. Durham’s design was borrowed directly from eighteenth-century Welsh vernacular architecture, to which the owners have added a leaping hare by Welsh sculptor Barry Flanagan (Fig. 1). It is a delightful and elegant moment that signals the spirit of what lies beyond the front door. In the front hall (Fig. 2) a guest’s arrival is announced by the gentle carillons of a nineteenth-century lyre-form rosewood grain-painted door chime. Here folk art from southeastern Pennsylvania mixes with a trove of modern paintings hung against plush red walls. A blue-painted chest, 1820-1830, with the decoration characteristic of the Mahantongo Valley of Schuylkill County has been placed below Broadway, a 1915 oil by Albert Gleizes, illustrating an unexpected visual relationship between the arts of mid-nineteenth-century Pennsylvania and those of Paris and New York in the years before World War I, when cubism was taking hold. In one corner, the rich black outlines of a 1938 watercolor by Paul Klee emphasize the shapes of the familiar flower, vine, and fan of the American toleware displayed on a southeastern Pennsylvania table. Entering the living room, it becomes apparent that the influence of Dr. Albert C. Barnes has played some part in assembling the collection. The couple’s choices are uniquely theirs, but the courage to combine works of art from different eras, cultures, and mediums–and the ability to see those visual relationships–suggest Barnes’s inspiration. “Oh yes,” the wife responds when the question comes up, “I took the Barnes Foundation’s Arts and Aesthetics course.” Inspired yes, but the juxtapositions here are singular–American neoclassical furniture dating from the 1790s to the 1810s combined with surrealist and abstract expressionist painting and sculpture. The couple collected what they liked and arranged it as they liked with no agenda except that of the eye’s pleasure. For any visitor–novice or trained–the success of collecting from the heart is apparent. Two fireplaces with matching surrounds painted in a high gloss bookend the living room. At the room’s center, two groupings of neoclassical furniture form a pathway, which is banked on one side by a shapely early nineteenth-century Baltimore black-painted card table flanked by a pair of red-painted Baltimore sidechairs from the same moment. Beyond them is a green-painted marble-topped pier table also from Baltimore. An opaque watercolor with crayon and collage by Joan Miró, L’homme au papier de soie, from 1934, hangs above it, with Paul Klee’s Betrachtsam nearby. The passion for early nineteenth-century neoclassical Baltimore painted furniture arose during a visit the couple made to the Baltimore Museum of Art soon after they moved into this house. The museum’s celebrated collection captivated the wife. The attenuated forms and the impulsiveness of the colorful decorative schemes that characterize Baltimore painted furniture seem especially well-suited to the spirit of the couple and to the way they collected. In front of the French doors leading to the patio is a bronze by Jacques Lipchitz, Baigneuse from 1960 (see Fig. 7). Miró’s Untitled, a sculpture from 1974, stands in the garden beyond. The biomorphic forms that characterize Miró’s work are also seen in a small oil on canvas, Groupe de personages (1938), that hangs in another corner of the living room in conversation with Jean (Hans) Arp’s small Sculpture automatique dit Le prisonnier, which is perched on a New York corner table (Fig. 8). The table’s slender legs and delicate bellflower ornament are a foil to the mass and tension emanating from the cool black sheen of Arp’s granite sculpture. Hers is an approach that has served these rooms well. The masterpieces of modern art by Jean Dubuffet, Willem de Kooning, Jasper Johns, and Juan Gris add variety, texture, and color to equally distinguished furniture in the living room, such as the extraordinary Philadelphia sofa of the 1790s and the diminutive Boston table of about 1815 in front of it (Fig. 6). At the other end of the living room a neoclassical New York breakfast table is placed in front of a contemporaneous square-back carved Massachusetts sofa (Fig. 3). Nearby are a Boston worktable attributed to the shop of John and Thomas Seymour and two outstanding Philadelphia armchairs, all dating from 1800 to 1810. In one especially inspired combination a red-painted Baltimore settee of about 1815 stands beneath a work by Max Ernst (Fig. 4). Originally painted in 1929, Loplop présente une cage, was modified by the artist in 1959 with the addition of a cage to the left of the figure as an homage to his friend and mentor Pablo Picasso. In the dining room (Fig. 9), a great variety of nineteenth-century American glass catches the light streaming through the floor-to-ceiling bay window. The 1820s New York dining table is surrounded by a set of chairs from Salem, with carving attributed to Samuel McIntire. A large Dubuffet, L’homme au papillon, hangs over a Baltimore sideboard dating to the late 1790s. Neatly proportioned and trimmed by the dot-and-dash string inlay popular in Baltimore, the expansive central opening has a gentle downward scallop designed for the shell inlay. Carefully cut veneers with exquisitely engraved details, here accented with green dye derived from copper oxide, give the illusion of undulation and dimension to the flat surface. Also on green-dyed panels above each of the legs are inlaid large lobed urns of leafy flowering plants. The burgeoning trade in and out of the port of Baltimore swelled the numbers and abilities of that city’s ambitious merchants–and cabinetmakers and specialist inlay makers were pleased to supply them with flamboyant furniture like this sideboard, as well as with the painted pieces also found in this collection. Design and ornament testify to the triumphs of Baltimore’s golden age of cabinetmaking, which lasted from 1780 to 1820. Two eagle scherenschnitte, or cut-paper stencils, above the sideboard exhibit precise scissor work and combine traditional Pennsylvania-German motifs with a proud patriotic fervor. However delicate, they are not outdone by the large Dubuffet next to them. A vibrant oil on canvas, L’Écuyère et son cheval of 1954 by Fernand Léger, hangs over the dining room mantel, which is one of the late eighteenth-century fluted and carved mantels that Durham placed in several of his houses. Two spatterware jugs perched on gilded brackets echo the painting’s large swaths of color. Motivated by the rooms that Henry Francis du Pont outlined with spatterware at Winterthur, the collectors massed a collection of it in the kitchen (Fig.10). The biomorphic shapes of Arp’s Paolo et Francesca–a relief painted on board–provides a strong focal point, reinforced by one from the set of five painted silk and string collages by Louise Bourgeois entitled Cinque (2005) hanging nearby. The same bold combinations fo form and color continue upstairs (see Fig. 12). Surrounded by wallpaper-covered hatboxes of the mid-nineteenth century, an early eighteenth-century New Jersey high chese of drawers on cabriole legs and Spanish (or brush) feet overlooks a medley of artworks, including a Roy Lichtenstein, a Joseph Whiting Stock portrait of a boy (whose pantaloons hang in an upstairs hallway), and a large Cindy Sherman photograph from 1988. At the top of the stairs and drawing in opaque watercolor by Alexander Calder from 1945 catches and holds your attention (Fig. 11). It is Calder’s rendition of the perfect room, which includes of of his own mobiles, a figural painting by Leger, a blue painting by Miro, and a relief by Arp. A joyful and highly personal statement about living with art, it is somehow emblamatic of the spirit of this house.